Dark Bunny Tees will be celebrating 50 years of Doctor Who by releasing two Doctor Who designs every month; one inspired by each of the 11 Doctors and the other inspired by a classic monster with a surprise design for December. These strictly limited edition t-shirts will also come with an exclusive collectors post card with 12 to collect throughout the year. The designs will be available as both men's and women's t-shirts and can be ordered from www.darkbunnytees.com/doctor-who/. Please check the website for prices and for shipping costs for the UK and International orders. The design for William Hartnell's era is available now and David Tennant's design will be released in October 2013. 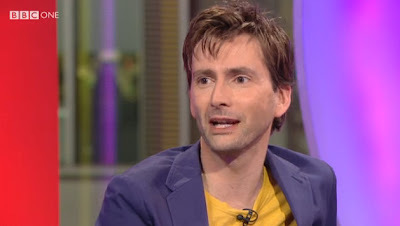 David Tennant was featured briefly on Daybreak this morning during an article on the new ITV2 show The Big Reunion. Showbiz presenter Richard Arnold, who interviewed David on Wednesday as part of the Broadchurch promotional tour, asked David which band he would like to see reform. David opted for the 80's Scottish band Hipsway and went on to give a brief rendition of their hit The Honeythief much to the delight of his co star Olivia Colman! You can check out David's vocal talents in the video below. The Doctor Who fan convention, Project Motor Mouth, which David Tennant took part in earlier this month has raised £30,920 for Janet Fielding's charity Project Motor House. The event was organised by Peter Davison to not only raise money for charity, but to raise the spirits of Janet Fielding who is currently battling cancer. 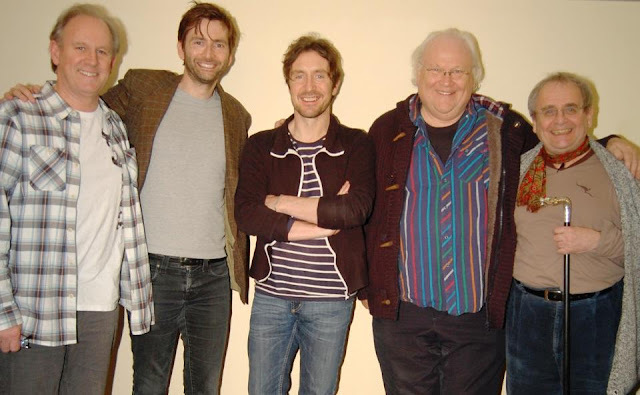 Five Doctor Who actors attended, as David and Peter were also joined by Paul McGann, Sylvester McCoy and Colin Baker. You can find out more about Project Motor House here. The new Red Nose Day campaign video has been released ahead of the fundraising event which will be held on Friday 15th March 2013. The video stars a host of celebrities revealing how they plan to raise money for the charity. Doctor Who's Matt Smith is seen outside the TARDIS saying "I'll decide what I'm going to do when I've got my fundraising kit" whilst a clip of David Tennant's previous Comic Relief trip to Uganda is also shown. The advert will air on BBC One tonight after The One Show and just before EastEnders. The Escape Artist is an original three-part suspense thriller set in the world of criminal law. 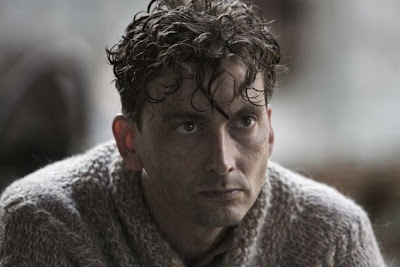 David Tennant plays Will Burton, a talented junior barrister who specialises in spiriting people out of tight legal corners, hence his nickname of “The Escape Artist”. Will is in high demand as he has never lost a case. But when his talents acquit the prime suspect in a horrific murder trial, that brilliance comes back to bite him with unexpected and chilling results.Filming begins today on The Escape Artist, a new 3x60-minute legal thriller for BBC One. Created and written by David Wolstencroft (Spooks, Shooting Dogs), The Escape Artist stars David Tennant (Doctor Who, True Love), Toby Kebbell (RocknRolla, Black Mirror), Sophie Okonedo (The Slap, Criminal Justice), and Ashley Jensen (Extras, Ugly Betty). The official Twitter account of BBC One have confirmed tonight that David Tennant will star in brand new drama The Escape Artist. Other confirmed cast includes Ashley Jensen, Toby Kebbell and Sophie Okonedo. The Escape Artist is a three part serial written by David Wolstencroft (Spooks) and made by Endor Productions. David Tennant plays Will Burton, a talented junior barrister of peerless intellect and winning charm who specialises in spiriting people out of tight legal corners. He is in high demand as he has never lost a case. But when his talents acquit the notorious prime suspect in an horrific murder trial, that brilliance comes back to bite him with unexpected and chilling results… not to mention a shocking twist in the tale. The drama is due to start shooting today. Full details and other cast will be confirmed in the full BBC Media Centre press release, to follow shortly. 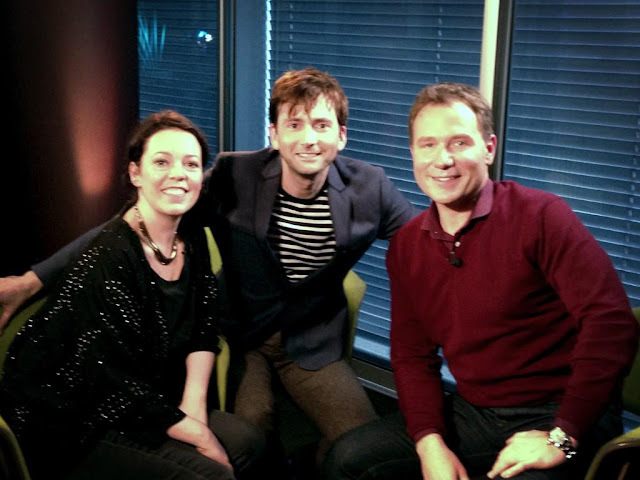 Daybreak presenter and showbiz editor Richard Arnold tweeted earlier this afternoon to say that he'd been interviewing David Tennant and Olivia Colman to promote their new ITV1 drama Broadchurch. "New ITV1 drama Broadchurch coming soon. Great stuff. 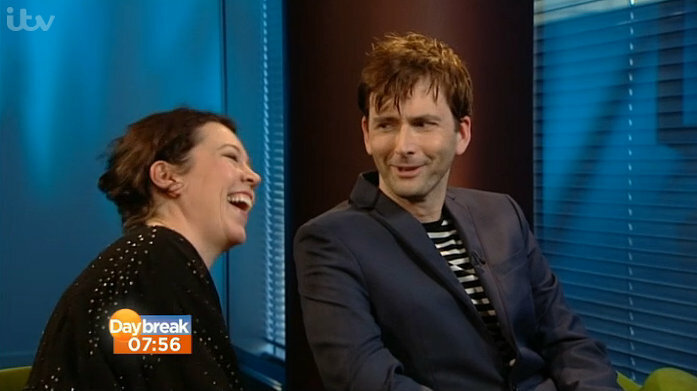 Cracking afternoon with stars David Tennant and Olivia Colman"
Visit our Broadchurch section here for more info. David Tennant narrates the latest John Downer Productions documentary, Penguins - Spy In The Huddle. It will air on 11th February at 9.00pm on BBC One. You can pre order the DVD which will be released on 8th April here. The winners of the 2013 Broadcast Awards are announced in a ceremony held at the Grosvenor House Hotel in London tonight. Twenty Twelve, the spoof fly-on-the-wall documentary series starring Hugh Bonneville, Jessica Hynes and Olivia Colman and narrated by David Tennant is nominated for Best Comedy Programme. The Broadcast Awards are at the heart of the industry calendar, shining a light on the UK's most acclaimed TV shows and the unsung talent that made it all possible. Every year over 1,200 of television's most influential individuals attend The Broadcast Awards black-tie evening. All entries have been judged on their creativity, quality, originality and results - in terms of ratings, critical acclaim and generally standing out from the crowd. On Wednesday 6th February, Bridport Arts Centre will be hosting a charity screening of episode one of Broadchurch starring David Tennant, Olivia Colman and Arthur Darvill. The crime drama was partially shot in the Dorset town. 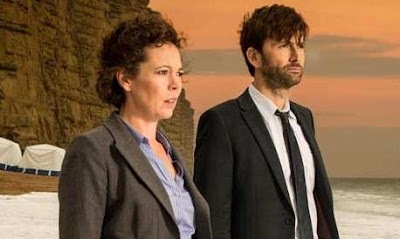 Bridport Arts Centre say: On Wednesday 6 February 2013 at 7.30pm, Bridport Arts Centre will have a sneak preview of the first episode of Broadchurch. This new ITV series starts at the end of February, so this is a unique opportunity to see it and hear about the making of it. Local author Chris Chibnall wrote and created this new drama. The director James Strong and the producer, Richard Stokes will join him for a Q&A following the screening. Entry is free but seats must be reserved by calling the box office on 01308 424204. 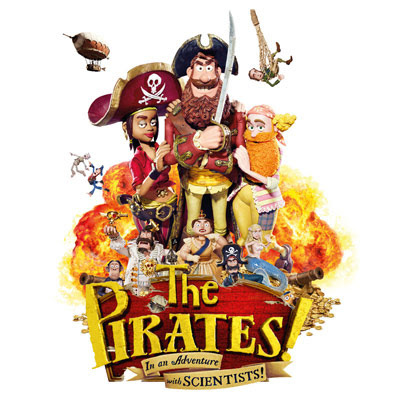 Donations towards Cancer Research and Bridport Arts Centre can be made after the screening. The screening is not suitable for children under 16. 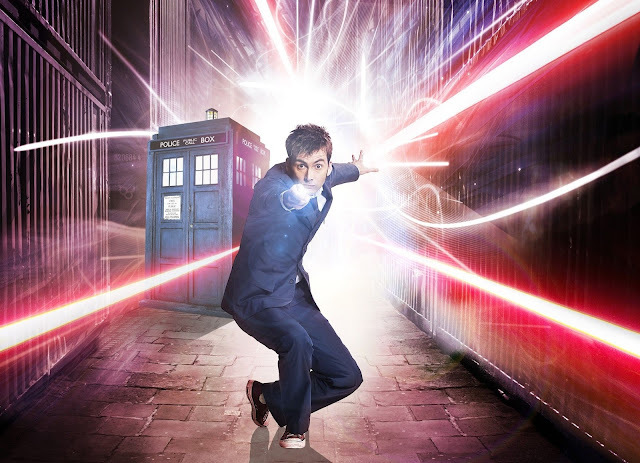 In celebration of the 50th Anniversary of Doctor Who, BBC America is running a brand new series of specials called DOCTOR WHO: THE DOCTORS REVISITED throughout 2013. The monthly programmes are each dedicated to one of the eleven Doctors with stars of the show (Matt Smith, David Tennant, John Barrowman) and members of the creative team (Steven Moffat, Caro Skinner) talking about that Doctor, their influence, and the show during their era. 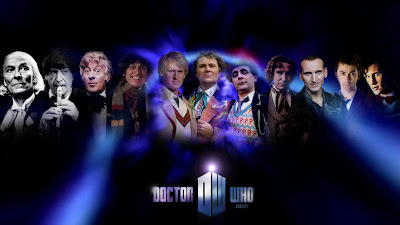 The specials are supported by a selection of classic Doctor Who episodes. The series started on Sunday 27th January with a special on William Hartnell’s First Doctor followed by a screening of The Aztecs (apologies for missing this one). The date for the second special on Patrick Troughton will be confirmed by BBC America very soon. The first of the specials will shortly be made available on iTunes. 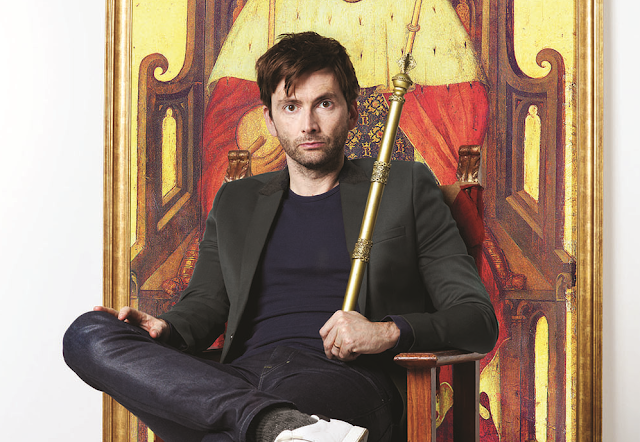 With the exciting news that David Tennant is to return to the Royal Shakespeare Company and star as Richard II from October 2013 (Read More) it's the ideal opportunity for fans to catch up on some of his previous Shakespearean work. 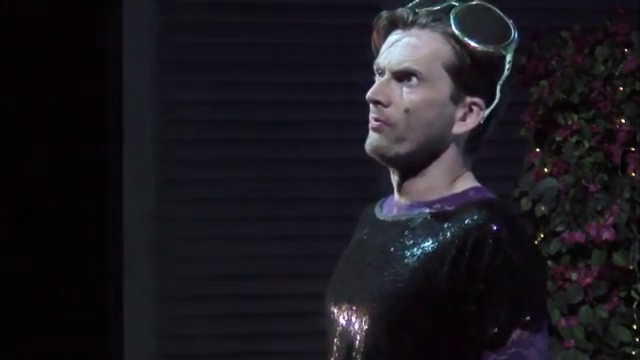 The summer of 2011 saw David Tennant and Catherine Tate appear together on stage for the first time in a brand new production of William Shakespeare’s timeless comedy Much Ado About Nothing. Two young lovers Claudio and Hero are to be married imminently but the devious scheming of a resentful Prince looks set to thwart the nuptials. Meanwhile, marriage seems inconceivable for reluctant lovers Beatrice and Benedick whose endless witty sparring threatens to keep them apart forever. Directed by Josie Rourke, Artistic Director of the Bush Theatre, Much Ado About Nothing is one of Shakespeare’s great plays and reminds us all of the failings and triumphs of the human condition in our never ending search for perfect love. To celebrate the 50th Anniversary of Doctor Who the BBC have commissioned Harlequin Goldsmiths Ltd to create a range of limited edition statuaries and a jewellery collection for ladies and gentlemen crafted from 9ct Gold and Sterling Silver. Each month will feature the release of a different item, all of which are stamped with a unique Doctor Who hallmark. For the first time in its history, the Goldsmiths’ Company Assay Office has granted the BBC the use of its iconic trademark to form part of a London hallmark. The BBC and Harlequin Goldsmiths are proud to announce the release of the Doctor Who 50th Anniversary mark. Only Doctor Who statuaries and jewellery manufactured by Harlequin Goldsmiths in 2013 will bear this special hallmark, following which the mark will be discontinued and the punch presented to the BBC archives. First Broadcast on 13th May 2006. Running Time: 45 Minutes. Viewing Figures: 9.20 million. The Tardis is trapped on a parallel Earth and the population is preparing for the ultimate upgrade. 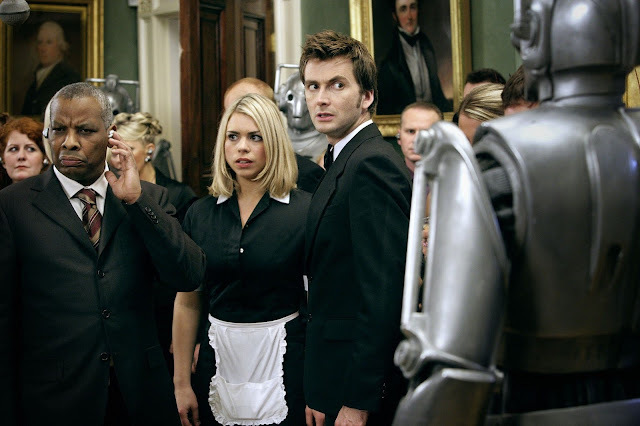 But sinister forces are at work and The Doctor runs up against an old enemy, The Cybermen. 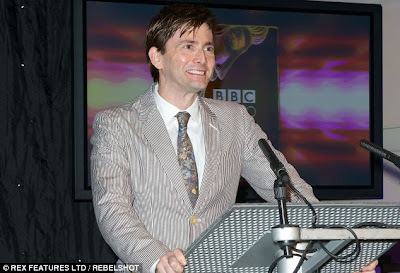 David Tennant hosted the BBC Audio Drama Awards at Broadcasting House in London last night. Photos have now started to appear from the event, which saw the likes of Vicky McClure, Andrew Scott and David Troughton receiving honours for their contributions to audio drama last year.Two productions that David worked on were honoured: Murray Gold received the Tinniswood Award for Best Radio Drama Script for Kafka The Musical while Believe It! won the Best Scripted Comedy section. 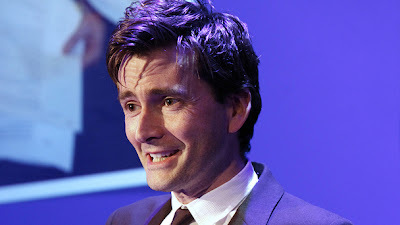 David Tennant was the host of the second BBC Audio Drama Awards tonight. The awards pay tribute to the cultural importance of audio drama, on air and online, and are intended to give recognition to the actors, writers, producers, sound designers and others who work in the genre. 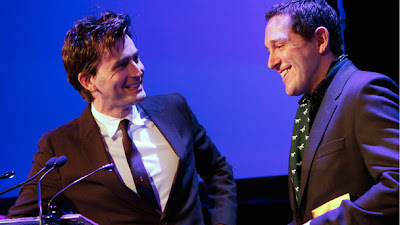 David was among an illustrious guest list at the Radio Theatre at Broadcasting House in London, which also included Maxine Peake, Stephen Mangan, Andrew Davies, Sian Phillips, Nicholas Parsons and fellow Doctor Sylvester McCoy. 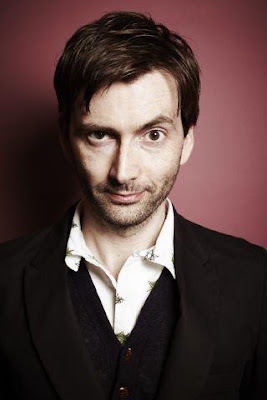 David Tennant is due to be taking up compère duties again tonight for the second annual BBC Audio Drama Awards. David hosted the inaugural awards last year where he was also named Best Actor in an Audio Drama for his role in Kafka The Musical.The ceremony will be held in the Radio Theatre at Broadcasting House in London. Believe It! -writtenby Jon Canter and produced by Clive Brill of Pacificus Productions. The comedy series starred Richard Wilson, David Tennant, Arabella Weir and John Sessions and purported to be based on Wilson's own life. The show is nominated for Best Scripted Comedy. David Tennant and Emilia Fox return to their roles as Leo and Emmi in Every Seventh Wave for BBC Radio 4 on Valentine's Day, 14th February. The drama is the follow up to Love Virtually, broadcast last year; both productions are adapted from the novels by Austrian author Daniel Glattauer. Every Seventh Wave is the eagerly awaited sequel to Radio 4’s witty and compelling love story Love Virtually in 2011, and sees Leo returning from Boston having cut off all email communication with Emmi. Emmi's husband had found out about the relationship that started when Emmi sent an email to Leo’s inbox by accident - and this revelation caused their relationship to implode. After repeated attempts to contact him, Emmi finally receives an answer from Leo, but can the internet lovers rekindle their written romance? And will they ever meet? With David Tennant and Emilia Fox. 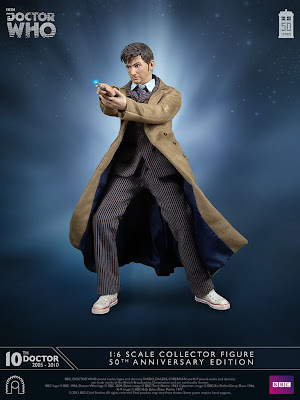 Priority pre-orders for the Big Chief Studios Tenth Doctor 1:6 Scale 50th Anniversary Edition Collector Figure went live yesterday with the Signature edition selling out in just 30 minutes. The Limited edition version is still available and goes on general preorder from 6pm GMT tonight. Virgin Media have unveiled their latest broadband ad campaign which showcases their superfast broadband connections. 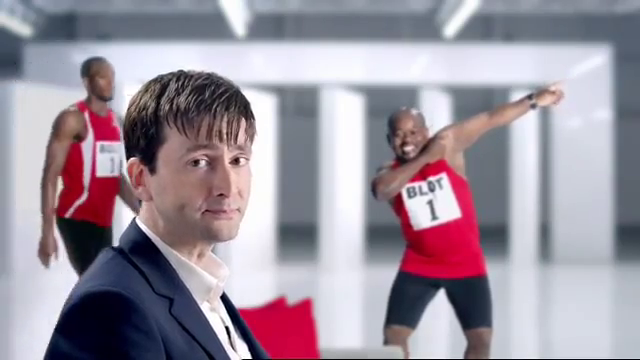 David Tennant is joined by the World's Fastest Man - Usain Bolt for the ad which also features a rather dodgy Usain lookalike! 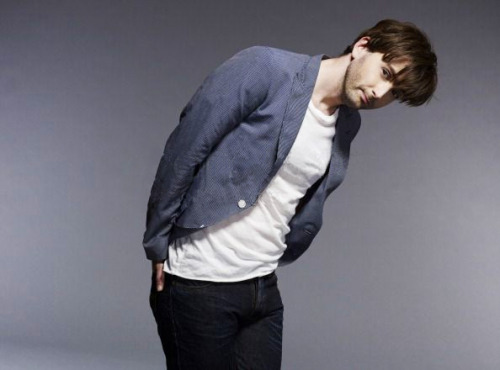 You can read about our day with David Tennant on the set of the ad campaign here. And download some caps from the advert here. The RSC have revealed the show times for David Tennant's run as Richard II in Stratford-Upon-Avon. The show's press night will take place on Thursday 17th October at 7.00pm and there will be a post show chat on Wednesday 16th October - although it is not known if David Tennant will take part in the chat. Tickets are not currently on sale, but Priority booking opens on Monday 11th February 2013. You can read more details in the RSC Winter 2013 Season Guide here. You can read the Royal Shakespeare Company's Winter 2013 Season Guide below, with many thanks to The RSC. 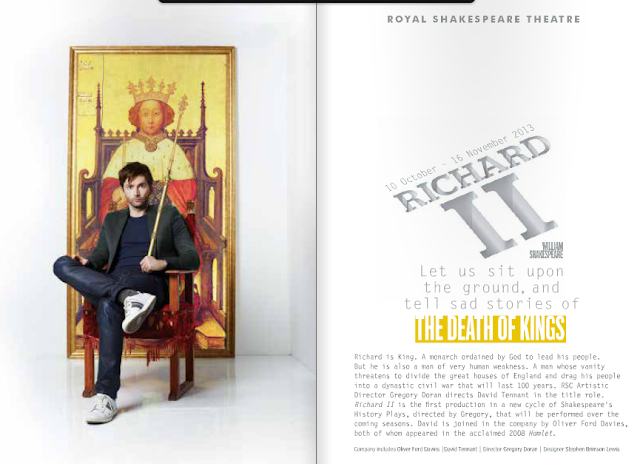 It contains information on David Tennant's Richard II, Wolf Hall, Bring Up The Bodies and Wendy & Peter Pan. The third episode of Spies Of Warsaw (Szpiedzy w Warszawie) will be shown on TVP1 in Poland tonight. We pick up the action as an alarmed Pakulski (Marcin Dorocinski) investigates the kidnapping of Mercier (David Tennant). At the same time, Mercier regains consciousness in the trunk of the car standing in an old, disused factory. Gestapo officer Voss (Rad Kaim) tries to squeeze out of Mercier who else he has recruited. David Tennant (Doctor Who) and Janet Montgomery (Entourage) keep you guessing in this intense spy thriller based on the Alan Furst novel. Set in Poland, Paris, and Berlin at the onset of World War II, the aristocratic French attaché to Warsaw, Jean-François Mercier (Tennant), feels drawn to the world of espionage and intrigue while he engages in a passionate, illicit love affair with Anna (Montgomery), a Parisian lawyer for the League of Nations. Shot on location. 3 hours on 1 Disc. 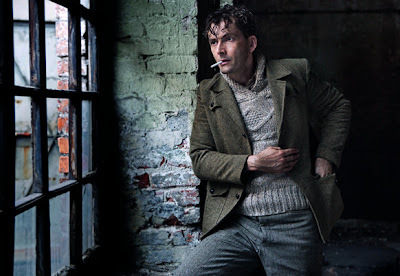 Spies Of Warsaw will be shown on BBC America starting from the 3rd April at 9pm/8c as part of the Dramaville block. Pre order you DVD here. Pre order your Blu-Ray here. 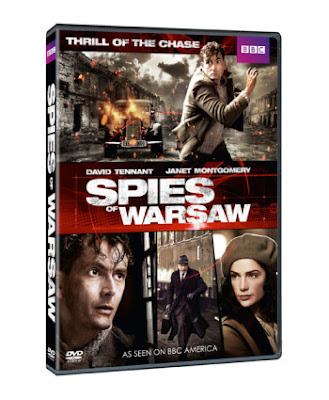 Spies Of Warsaw starring David Tennant and Janet Montgomery will be shown on BBC America in two parts on Wednesday 3rd April and Wednesday 10th April at 9pm/8c. The show makes up part of BBC America’s acclaimed Dramaville programming block.